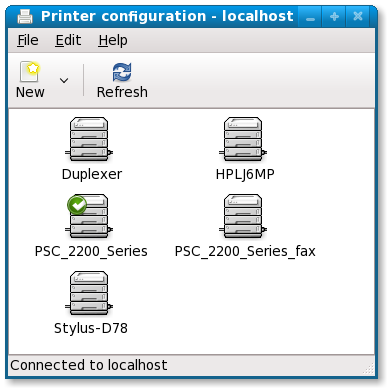 I’ve released system-config-printer 1.0.0 and built it for Fedora’s development tree. The main focus has been improving the way the application looks and behaves. One new feature I’ve been working on is the improved Windows print share browser. Instead of executing the smbclient command and parsing its output to find print shares, the new browser uses libsmbclient. Print shares which cannot be discovered without authentication should now appear in the browser, after a prompt for the user name and password. There is also support for proxy authentication. This is when you have submitted a print job to a queue for a network printer, but the remote printer requires authentication. When this happens, the CUPS backend responsible for transporting the job to the network printer stops and waits for authentication details. 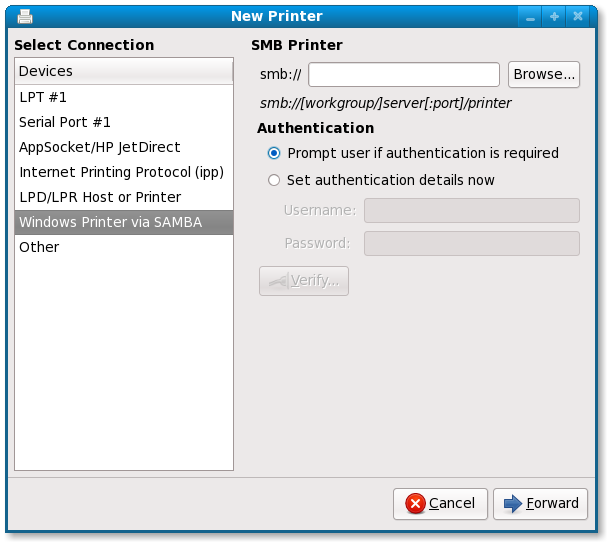 In system-config-printer 1.0.0, the print applet now spots this, displays an authentication dialog, and passes this to CUPS for it to complete the job. This works for the ipp backend, but not yet for the smb backend. The samba v3-2-test branch has code to deal with this, but it doesn’t yet work for me (although I have a one line change that fixes it for me). As a result, the “prompt user for authentication” option just has the effect of not providing any authentication details at all at the moment. This entry was posted on Thursday, May 29th, 2008 at 12:23 pm	and is filed under Software. You can follow any responses to this entry through the RSS 2.0 feed. Responses are currently closed, but you can trackback from your own site.